"It has come about quickly but I'm just delighted to be down here," he said. 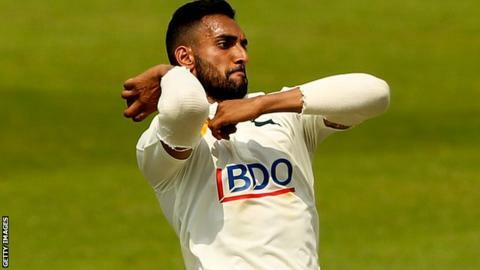 "This move has been made purely for cricketing reasons and I'm hoping to get the best I can out of it to progress my career." He added: "I'd like to thank Notts for being so understanding." "Ajmal hasn't yet fulfilled all of his potential. He can bowl with a yard of pace and has the potential to be a genuine bowling all-rounder." Sussex's cricket manager Mark Robinson described Shahzad as "a cricketer of great ability". "He hasn't yet fulfilled all of his potential," Robinson said. "He can bowl with a yard of pace and has the potential to be a genuine bowling all-rounder. "We hope he can have a similar impact that Chris Jordan had, and fulfil the same role helping balance the team."